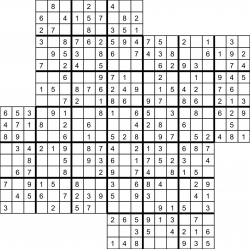 Windmill Sudoku consists of five grids, one in the center and the other 4 overlapping the central one. Fill in the five grids so that every row , every column , and every 3x3 box contains the digits 1 through 9. This means that the numbers must be placed correctly for all the five puzzle squares.